This is a great run for novice boaters and on the Rumsey run especially it is simple to take a private raft or kayak on the creek. There are benefits to using a commercial outfitter for this also. The main part being that while you are able to commandeer your own water craft (since both commercial rafting companies do not provide guides but rather place swiftwater rescue personnel at certain locations along the creek) all your food, lodging and gear is provided for you. Permits are not necessary on Cache Creek. So get a boat, grab some friends, pack a cooler full of food, and have a great day on the river. The Wilderness run can be done in a one-day trip but there are some really nice camp spots along the river that make a two-day excursion even more enticing. Rumsey Run is a one-day trip but camping is recommended either before or after the trip. For an inexpensive way to escape the summer heat, Cache Creek is a great option. 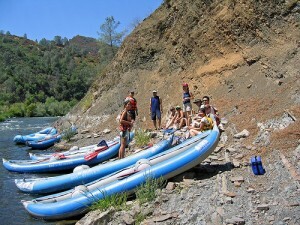 Just a short drive from the Bay Area, you can rent boats and do a self-guided float trip. Commercial companies provide shuttles for customers. Ample parking can be found at both put-in and take-out for both runs for private trips. Wilderness Run – BLM River Access right bank, downstream from Hwy 20 bridge over the North Fork. Rumsey Run – Access the river at Bear Creek in the Yolo County Regional Park. Wilderness Run – To leave a car at take-out, from put-in drive east on Hwy 20 for 13 miles, turn south on Hwy 16 and travel 7 miles to Yolo County Regional Park. Rumsey Run – There is parking along Hwy 16 near Rumsey bridge.